Jake Noll walk-off walk! This was a wild game! This was one ugly game but it became a pretty win for the Washington Nationals in walk-off fashion to hang the first loss of the season on the Philadelphia Phillies. The Nationals bullpen imploded in the 8th inning and the Phillies bullpen spiralled out of control in the 8th and 9th innings. It was the rookie Jake Noll with three total plate appearances in his MLB career that is not even a week old. He entered the game in the 9th inning against former All-Star reliever David Robertson with bases loaded and no outs, and Noll worked a 3-2 pitch to a walk-off walk. This win was maybe as improbable as how Jake Noll made it to the Major Leagues. In this game, both teams played some sloppy baseball, and it seemed the team that made the last mistake would lose. The Nationals erased three of their own baserunners on second base today to some questionable baserunning. One runner was thrown out at 3rd base on a late read and then two clear TOOTBLANs from Victor Robles and Wilmer Difo, but it was the third defensive error by the Phillies in the 8th inning that turned the game around along with the Phillies own bullpen meltdown. The Nationals offense was led by Juan Soto and Anthony Rendon who both went 3-for-4 in the game and each had a home run. Soto was a triple shy of hitting for a cycle. Ryan Zimmerman clubbed his first home run of the season in the first inning off the right-handed Aaron Nola to make the score at the time 3-2 in favor of the Nats. After the Nats took a 6-2 lead on ace Aaron Nola, they knocked him out of the game early, but the lead eventually evaporated in an 8th inning bullpen meltdown as the Nats have now surrendered 14 runs in the first 5 games of the season in the 8th inning. Anibal Sanchez was knocked out in the 4th inning after he took a comebacker off of his quadriceps muscle in his upper leg that tightened up on him which caused the bullpen to finish the final 5 innings of the game. There were bright spots in the bullpen as Justin threw 2 innings of shutout baseball and Matt Grace covered one inning where he did not yield a run. Sean Doolittle threw a scoreless 9th inning and earned the win. These types of games are team wins. Noll never gets his shot if not for circumstances before he entered the game as a pinch-hitter. Three men got on base before him to make that moment possible. In the 8th inning, it was Andrew Stevenson‘s pinch-hit single along with a clutch RBI double by Yan Gomes, and a big Phillies error by Rhys Hoskins that tied the game up at 8-to-8. Much credit has to go to Adam Eaton for booking it down the line on that comebacker to the pitcher who threw to Hoskins who alligator-armed the throw as Eaton entered his peripheral vision on that routine play that ended in a costly error scoring Gomes to tie the game. In the top of that 8th inning, it was the Nats’ bullpen meltdown that allowed 4 runs to score. It looked bleak at that point for the Nationals, but they never gave up. While Tony Sipp and Kyle Barraclough were each charged with a run, it was Trevor Rosenthal who once again entered the game and could not record an out. Rosenthal was charged with two runs. 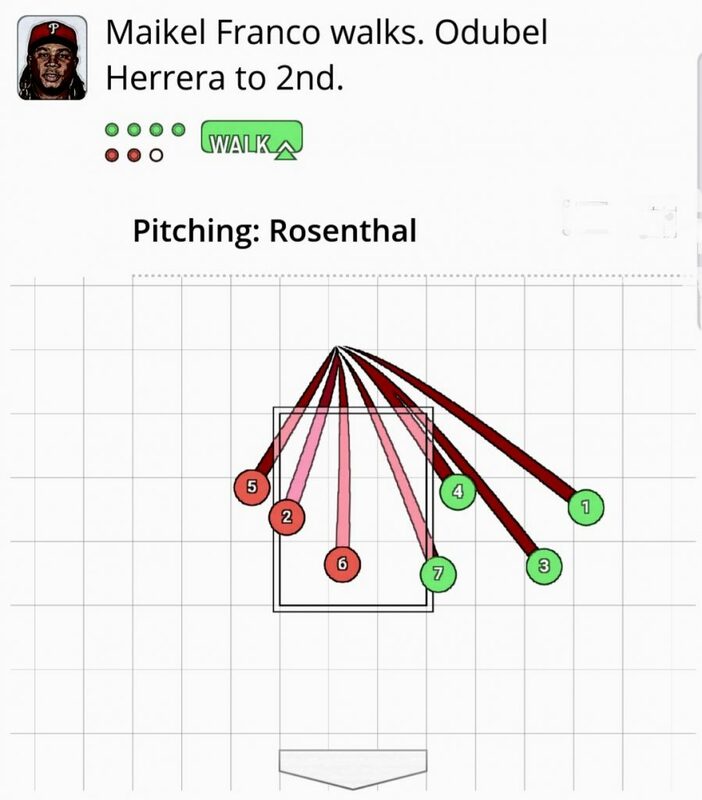 In Rosenthal’s defense, the umpiring was inconsistent all game, and he threw a painted 4-seamer on the plate that was ruled ball four when it should have been strike three. Of note, all of the strikes were from foul balls. 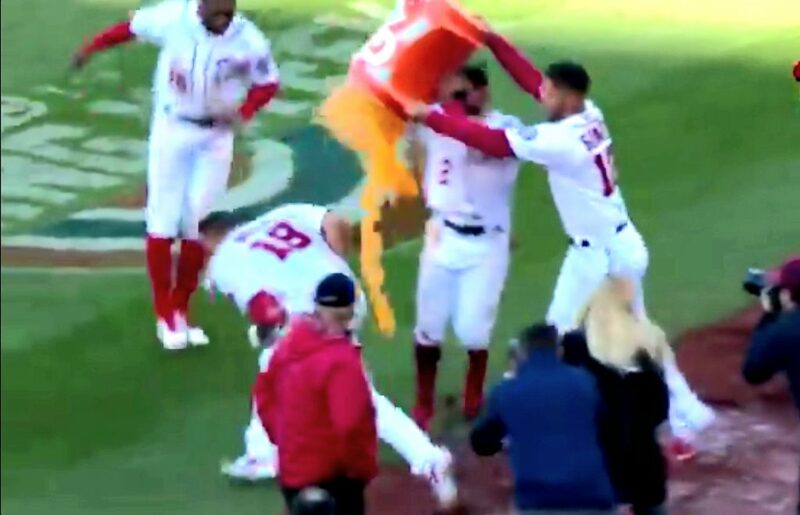 It is the Nationals second win of the season and both by dramatic come-from-behind wins that were culminated with dramatic walk-offs after a Nats bullpen meltdown. For Jake Noll, the fact that he got this shot was so remote as he entered Spring Training as a non-roster invitee for a team that looked set until Michael Taylor and Howie Kendrick were injured opening up spots for Andrew Stevenson and Noll. Now that Kendrick is set to come off of the 10-day DL tomorrow, it most likely is Noll who will head to Fresno, California to join the Triple-A roster. Noll will always have this dramatic moment, and the photos of the Gatorade celebration as photographic proof along with the baseball that was taken for ball four to push the decisive run across the plate. UPDATED: At 6:50 pm, the Nationals announced that Jake Noll was optioned to Triple-A Fresno. Note that Howie Kendrick cannot be activated off of the 10-day DL until tomorrow which will be the corresponding move.